"I Think You Need New Brake Shoes"
Someone took the "pull up and check up" sign a bit too seriously. This gas station was on the north side of Oak Street at First. The building to the right is still around, now housing Ground Coffee Shop. The gas station lot now houses the New Yasui building, with Celilo restaurant on the ground floor. The first case of "unintended acceleration".....darn modern electronics! 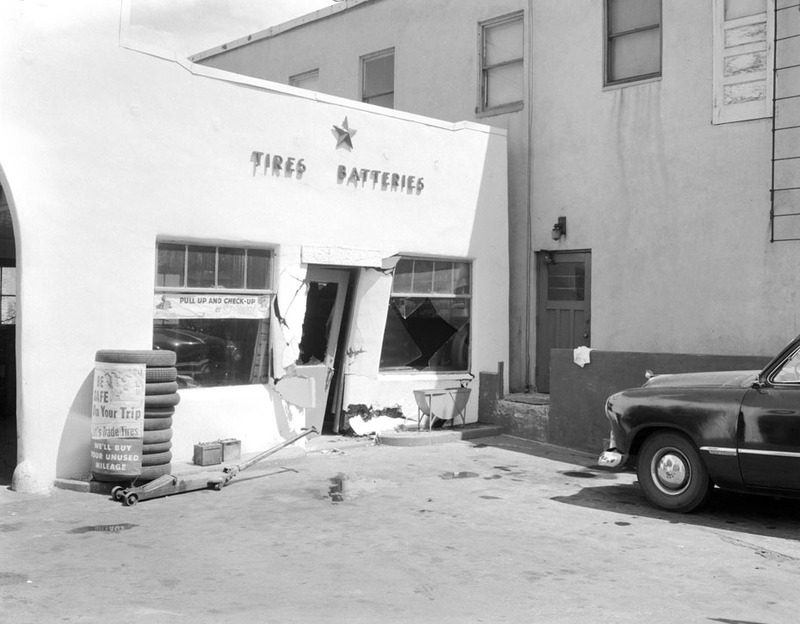 At the time of this picture, the building on the left was Kramer's Texaco. The building on the right was the Downing Building (prior to WWII, it had been the Yasui Building). The 2nd floor window next to the corner of Kramer's was our bedroom. Oddly enough, only our bedroom was on that side of the building. Downing had remodeled the upstairs in 1943 and he wanted to maximize the number of renters he could get. So, instead of having 4 apartments, one on each corner--he had put one in the middle too. But that meant that our living room, kitchen, and bathroom were across the public hallway for the other apartments. Our apartment cost $35 a month--cheaper than the other 4 because of the inconvenience. This was Elmer Kramer's station. His son Jerry took over when Elmer passed away at an early age. Jerry later moved to the Mobile station at 4th and Oak. That had to be a pretty good brake failure to do that much damage. Do we know who slammed into it? I like the fire escape, ever try it Bill? Just wouldn't want to sleep walk out that door...... Yes, remember that gas station well.....back in the days when "service" was actually part of the fill up. A silly little sidebar for this picture: When it would get hot in the summer, Elmer would want to try to cool off his station building. So he would ask my Mom and she would let him go out through our bedroom window to set up a sprinkler on his roof.